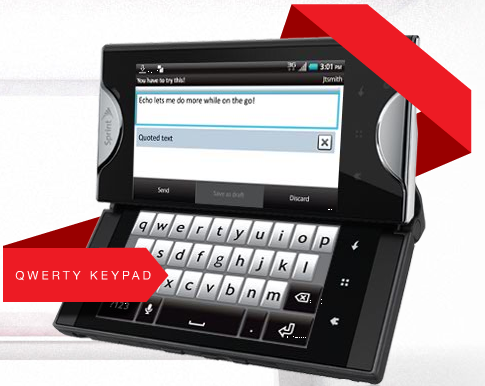 The Kyocera Echo: Industry First or Nintendo DS Phone? When I heard that Sprint wanted to create an industry first, I didn’t imagine they would come up with this. Yesterday, Sprint and Kyocera unveiled the fruit of their digital conception: The Kyocera Echo. Single-Screen Mode – a fully functional single-display experience. Simul-Task™ Mode – choose 2 of the Echo’s 7 core apps and run one on each display simultaneously. Optimized Mode – optimized apps let the dual displays complement each other, like email on one and a full virtual keypad on the other. Tablet Mode – dual displays act as a single oversized (4.7 inches diagonally, 800 x 960 pixels) display ideal for multimedia. Other features on the Echo include the Android 2.2 running at the core and the more basic capabilities such as Wi-Fi hotspot for up to 5 devices, 1 Ghz Snapdragon processor, and a camera capable of 5MP photos and 720p HD video. Now for the opinionated section. This device deeply resembles the Nintendo DS with the dual screens flipped open. Now I don’t think I would want a device in my pocket with such a complicated design. I rather scare myself saying that since I do usually like devices of complicated origins until now. However I’m not the only one who expresses such an opinion. According to this poll by Android Police, not too many other people are thrilled about the Echo as well.